Beyond any commonplace, "freedom" � especially for drilled musicians endowed with sympathetic aesthesia � represents a possibility of probing tradition and newness through the use of detailed construction in symbiosis with the removal of predigested concepts. Even more frequently, an instrumental unit mixes all those components; that's when things can get interesting � or plain horrible. How many albums of reinterpreted standards smelling of stale bread must we endure? How come several theoretical "free jazz" recordings flash an "establishment" billboard from the very first notes? Why a player whose beginnings appeared innovative becomes a face pouting from the cover of cool magazines while the music keeps descending towards the hades of mediocrity? 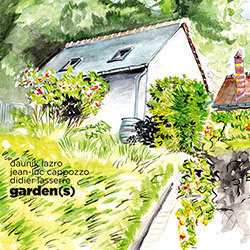 Saxophonist Daunik Lazro, trumpeter Jean-Luc Cappozzo and percussionist Didier Lasserre do not belong in any of the aforementioned situations, Garden(s) � a session recorded in July 2016 � being a praiseworthy attempt to retain at least a modicum of sinlessness in a context originating from jazz roots. The three picked a few evergreens � such as "Sophisticated Lady" and "Lonnie's Lament" � then applied the "let's see where the music takes us" principle quite correctly. The process of remembrance and subsequent deconstruction of the original is carried on with remarkable clarity, allowing us to locate our reserved place inside the interaction without disorientation. The melodic constituents and the timbral grains supplied by Lazro and Cappozzo coalesce with Lasserre's sparse drumming almost flawlessly; the moments in which we register surges of tension still show a commendable balance. The remainder of the set is made by improvisations in the literal sense, the artists charting their own distinctiveness by trusting each other's spacing. They play with and within the textures, wink to silence before returning to acoustic plenitude, exhibit innate abilities deprived of psychobabble and plastic truths. The importance attributed to technical finesse equals that of a sensible pragmatism; mutable realities and little mysteries never diminish the performance's credibility. Reputable instrumentalists, yes. Intelligent men, too. This trio's disciplined receptiveness will do wonders for listeners tired of hearing commercial tunes with a couple of semi-slanted guitar lines dispatched for "the new thing". En avant, vieux enfants.